Nancy Gofus joins .ORG, The Public Interest Registry (PIR) as Chief Operating Officer.ORG, The Public Interest Registry (PIR) — manager of the world's third largest generic top-level domain — today named Nancy Gofus as chief operating officer. A long-time veteran of the telecommunications industry, Ms. Gofus will oversee the marketing, sales, product and strategy functions, helping CEO Brian Cute expand PIR's global presence as well as develop and execute marketing strategies that further grow the .ORG domain in existing and new markets. Currently, Ms. Gofus serves as board chair of the national board for Volunteers of America — a national non-profit dedicated to helping those in need live healthy, safe and productive lives. In this capacity, she works closely with the executive team on expanding the organization's reach and raising awareness of its efforts in helping senior citizens, veterans, and at-risk youth, children and families nationwide. Previously, Ms. Gofus' served as senior vice president of global product management for Verizon Communications in 2009 and chief marketing officer at Verizon Business from 2006 to 2008. In that capacity, she was primarily responsible for delivering and communicating Verizon Business' value proposition by developing and overseeing the marketing strategy, advertising, brand management, and product management. Prior to the Verizon/MCI merger in 2008, Ms. Gofus developed and delivered MCI's new generation of services, guiding the evolution of MCI's product line and helping companies make the transition from traditional data services to IP services. "Nancy brings to PIR that unique blend of non-profit, marketing and communications experience which directly speaks to PIR's core mission to both serve in the public interest and provide a safe, more secure Internet," said Brian Cute, chief executive officer of PIR. "Nancy's business acumen and international experience will help continue our reputational growth as an exemplary registry and further solidify .ORG's position as the domain of choice for non-profits, individuals and the like. As the Internet grows due to the introduction of new top-level domains, so will PIR's commitment to the public." Added Ms. Gofus: "As a non-profit, PIR understands the needs of that community and has truly been seen as partner to international organizations looking to build their online presence. I have long admired their work, and I'm thrilled to have the opportunity to work alongside Brian and the rest of the PIR team to help advance .ORG's impact and reach on a global scale." 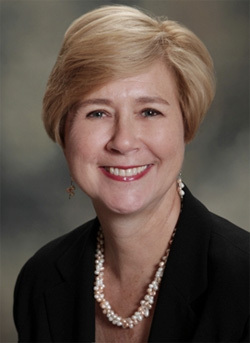 A graduate of the College of William & Mary, Nancy also currently serves on the Foundation board of The College of William and Mary. Previous work experiences include time as executive vice president of marketing and customer care for XO Communications from 2000 to 2003. During her tenure, she helped drive the company's growth from $250 million in revenues to over $1 billion. Local Time: Thursday, April 25, 2019 08:56 AM PDT – Page Load: 0.2745 Sec.